RBSE 12th Result 2018 for Arts Stream has been declared on 1 June 2018. The Rajasthan Board 12th Arts Result 2018 has been announced by the Rajasthan Board of Secondary Education in the online mode. The students can check their results by clicking the direct link which has been updated below. The Rajasthan Board Senior Secondary Exams for Arts stream was successfully conducted from 8 March to 2 April. Total 5,37, 259 appeared from the Arts stream, out of 826,278 students who appeared for the RBSE Senior Secondary Exam this year. The overall pass percentage stood at 88.92% this year. The girls have once outperformed the boys. The link to check the RBSE 12th Result 2018 has been made available on this page. Students have to enter their exam roll number on the result page to check result. They should also take a printout for future reference. Last year, the Rajasthan Board 12th Arts Result was released on 27 May 2017. RBSE 12th Result 2018 for Science and Commerce stream was declared on 23 May. The result was announced by the Rajasthan Board of Secondary Education on the official web portals of the RBSE. This year, the overall pass percentages for Science & Commerce streams stood at 86.60% & 91.09%, respectively. Deeksha Agarwal (97.6%) and Vishwendra Singh (99.40%) are the new toppers in Commerce and Science streams, respectively. The girls have yet again outperformed the boys. The students can check their RBSE 12th Science & Commerce Result 2018 by entering their roll numbers to check the results. Register Here for Free SMS Alert on Rajasthan 12th Result. We will send you an alert as soon as the result is declared. The RBSE 12th Arts Result 2018 is going to be announced on 1 June 2018. The Rajasthan Board result of Class 12 for Science & Commerce Stream was released on 23 May. The candidates who have appeared from the Arts stream can check the RBSE Result 2018 Arts by following the link on this page. The link to check the Rajasthan board 12th Result has been updated below. The candidates are suggested to keep themselves updated through this page for updates regarding Rajasthan Board Class 12 Result. Step 1: Students should, first of all, click a direct link which will be provided below immediately after the declaration of the result. Step 2: Clicking the direct link will redirect them to the Result login where they need to fill in their roll no. in the space provided and hit the “Submit” button to view the result. Step 3: After providing all the details as mentioned above, RBSE 12th Result 2018 will be highlighted on the computer screen. Step 4: Now, students also can take a printout of Class 12 result by clicking the “Print” button for future reference. The image given below is just for illustrative purpose. The above graph depicts the total number of students appeared in Science, Commerce, and Arts for the years 2016 and 2017. The graph makes it clear that the total number of students appeared from Arts stream is the highest, followed by Science and Commerce streams. 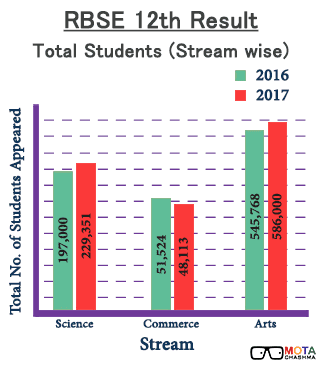 While in Arts and Science streams, the total number of students appeared in the RBSE exams have increased in the year 2017; it declined marginally in case of commerce stream. The following table reveals that the total pass percentage increased marginally in 2017 from what it was in 2015. However, total no. of students appeared for the exams declined marginally in 2017 from 2016. The table given below shows that the total pass percentage dipped marginally in 2017 as compared to the same in 2016. The total no. of students appeared in the exam increased in the year 2017 from the same in the year 2016. The table given below makes it clear that the overall pass percentage, as well as boys’ and girls’ pass percentages, have been increasing over the years. This is a positive sign. Besides, following the national-wide trend, the girls have outperformed the boys in terms of pass percentage. However, after a decline in 2016, the total no. of students appeared for the RBSE Exams, increased in 2017. 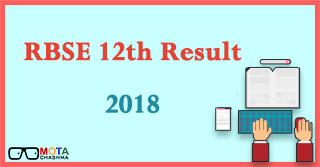 What after RBSE 12th Result 2018? Once the Rajasthan Board 12th Result is over, those candidates who are not satisfied with their result can apply for rechecking. Besides, there will be supplementary exams for RBSE 12th Class, which are usually held in June/July, every year, while the supplementary results are announced in August. The successful candidates can go for higher level studies by seeking admission to the programmes in various streams such as engineering, medical, arts, commerce etc. from universities such as Rajasthan University, Rajasthan Technical University, Kota University as well as from the universities situated in other states. If any of the students are not satisfied with their Rajasthan Board Result 2018, such candidates can apply for re-evaluation and recheck of answer sheets. If there is any change in the final score, the Rajasthan Board of Secondary Education (RBSE) would consider that and will revise the marks in the original mark sheets. More detail regarding answer sheet rechecking is available on the official website of Rajasthan Board. MHRD has come up with a scholarship programme named Central Sector Scholarship for College and University students. This scholarship is given on merit basis to all the Class 12th toppers, who fulfil the eligibility criteria. The students can apply to the Central Sector Scholarship after the RBSE 12th result is declared. The scholarship will be given to the students until post-graduation.